We have access to special pricing for a variety of wheels and rims. Please call us if you don't see what you are looking for. 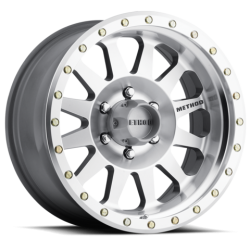 Starting at $177 per wheel with FREE SHIPPING to continental US. Buy 5 and recieve an additional 10% discount! We can order these in any size you need. Please contact for proper size and pricing. The Method MR304 Machined is a one.. Starting at $152 per wheel with FREE SHIPPING to continental US. Buy 5 and recieve an additional 10% discount! We can order these in any size you need. Please contact for proper size and pricing. The Method MR304 Matte Black Double Sta.. Starting at $139 per wheel with FREE SHIPPING to continental US. Buy 5 and recieve an additional 10% discount! We can order these in any size you need. Please contact for proper size and pricing. The Method MR301 Machined Standar.. Starting at $139 per wheel with FREE SHIPPING to continental US. Buy 5 and recieve an additional 10% discount! We can order these in any size you need. Please contact for proper size and pricing. The Method MR301 Matte Black Stan..